TCL Electronics is all geared up to disrupt the Indian QLED TV market with the launch of the 65X4, India’s first Google-certified Android QLED TV. The brand has already received a highly-encouraging response to the 65X4 from Indian customers after the launch event. The 65X4 launch also makes TCL the first brand to introduce a Google-certified Android QLED TV with Harman Kardon speakers in India. During the festive sale on Amazon, TCL registered an 80% year-on-year increase in its revenues and was amongst the top performers in the smart and 4K segments. With smart TVs accounting for more than 60% and 4K TVs comprising over 40% of TCL’s overall sales during the campaign, the response highlighted a growing evolution in the home entertainment preferences of Indian customers. QLED (Quantum Dot LED) is powered by Quantum Dot Technology. Each and every pixel is coated with nano crystals to produce more heavily saturated and precisely-defined primary colours. This move away from the usual inefficient and limited approach of combining white LEDs and colour filters allows QLED TVs to offer a colour ratio up to 110% of a normal LED TV. In addition to providing more vivid and immersive real-life picture quality, QLED TVs have much lower power consumption and high panel lifespan. The introduction of TCL 65X4 is expected to be a game-changing development within the QLED TV space in India, currently dominated by Samsung, and is expected to deliver the best, most immersive audio/video experience to Indian consumers. Offering unique features such as a Google-certified Android system, Harman Kardon speakers, and MEMC, TCL is disrupting the market by enabling access to state-of-the-art home entertainment technology at the most affordable prices. 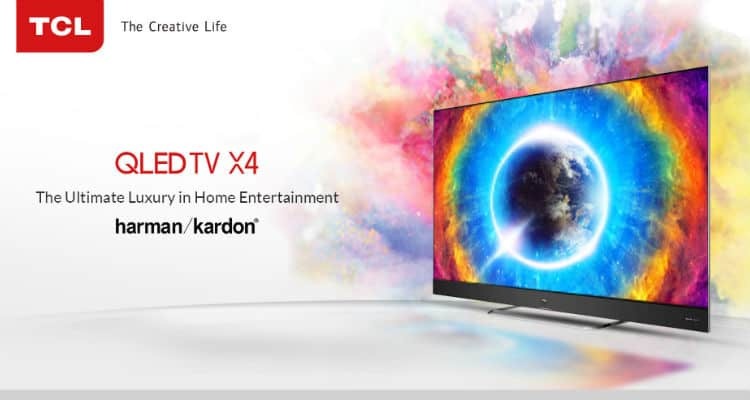 The launch of the 65X4 marks another impressive addition to TCL’s innovative India portfolio and is aimed at redefining the home entertainment experience for customers across the country. The Google-certified Android N QLED TV comes equipped with several other cutting-edge features. The powerful Harman Kardon speakers deliver immersive, high-impact sounds, accentuated by Dolby’s advanced DTS post-processing technology to create a rich acoustic field. QLED redefines on-screen viewing by replicating real-world colour volumes and recreating an incredibly in-depth, lifelike image resolution. This is complemented by 4K UHD and HDR, which reproduce all shades of light and natural colour in stunning detail to provide a truly immersive viewing experience in 3,840 x 2,160 pixels. Furthermore, the innovative microdimming technology enhances the colour gamut to provide more dynamic and vibrant contrast. The 65X4 also comes equipped with MEMC (120 Hz) technology to provide unparalleled motion-smoothing on screen which, enhanced by TCL’s proprietary algorithm, ensures that viewers can experience every detail of fast-moving, action-packed content on both TV and multimedia signals. Powered by 64-bit Quad-core CPU and Dual-core GPU, along with a 2.5 GB RAM and 16 GB storage, the 65X4 enables seamless multitasking and reduces non-responsiveness. And that’s not all! With advanced features such as voice search and Chromecast built-in, the 65X4 ensures that users have a non-stop, high-quality, home entertainment at their fingertips! The 65X4 will be available for purchase at a special launch offer price of INR 1,09,990 along with INR 10,000 Amazon Pay cashback. So what are you waiting for? Upgrade your home entertainment experience with TCL’s innovative Google-certified Android QLED TV and feel the difference – today!